Google and its quasi-subsidiary YouTube have been behaving less like bastions of free speech and more like Communist censorship squads of late. YouTube has upped its shadow-banning program of conservatives, and Google has fired a decorated engineer for sharing scientifically-backed arguments against "social justice" campaigns. When entities "come to the dark side", it's pretty much always going to be a Pluto-to-Pallas transit. Other factors can also be evident. Here we have transiting Pluto quincunx Google's Pallas and sextile Google's progressed Pallas. Progressed Pallas is conjunct progressed Jupiter, which suggests ethics (Pallas) becoming public (Jupiter) -- the Pallas-Jupiter dynamic is generally present in ethics scandals. 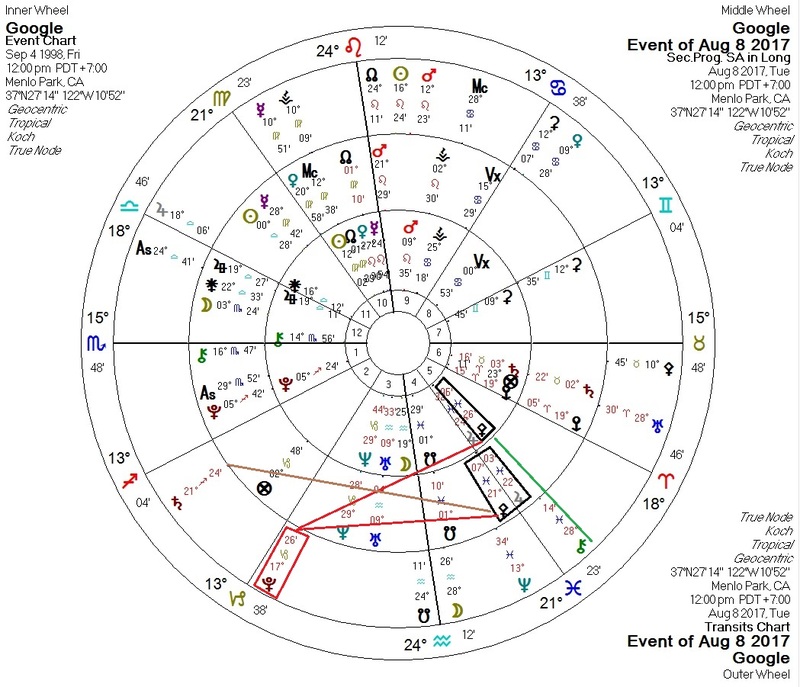 Pallas is also under hard aspects from Chiron and Saturn, a situation that President Trump was in earlier in the year when he began apparently reversing his foreign policy.